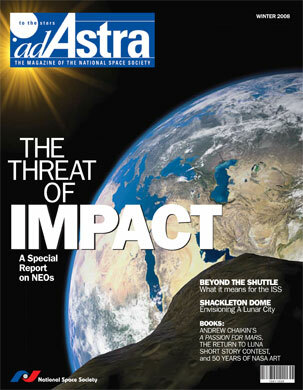 On The Cover: An artist’s rendering of an asteroid moments before an imminent impact with Earth. The question of such an impact is not if but when. Illustration: Stephen Prater. Note: The entire Special Report on “The Threat of Impact” (comprising pages 22-46 of this issue) is available as a PDF file [1.7 MB]. What it will take to build a 25-mile-diameter, 5,000-foot-tall domed lunar city. With the pending retirment of the space shuttle fleet, NASA makes plans to use Russian spacecraft to maintain the International Space Station. Detection, deflection, or deep impact? One of the greatest threats to civilization remains unaccounted for. Possibly more accessible than the Moon, could a near Earth asteroid be the next stop for manned space exploration? NSS is an independent nonprofit nonpartisan educational membership organization dedicated to the creation of a spacefaring civilization. Our vision: People living and working in thriving communities beyond the Earth, and using the vast resources of space for the dramatic betterment of humanity.